While I lived in Lexington, I had the privilege of getting to work with leaders in the equine health industry in many facets. I’ve always enjoyed talking with Stuart Muir, resident farrier at Rood & Riddle Equine Hospital. Stuart is a wealth of information when it comes to the horse’s hoof, so when he knows of a podiatry topic horse owners need to learn about, he and I work together to get that information out there. 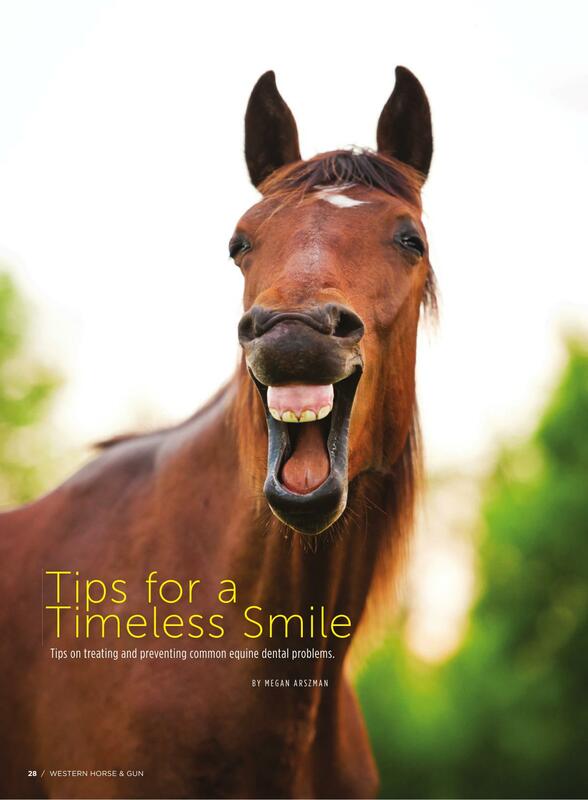 Just as with humans, a horse’s teeth are the most important component to overall wellness. If they’re not probably cared for, their health can deteriorate–his coat can become dull and lifeless, weight can drop, and his behavior will be affected. That’s why equine dental health is so important. In this article, written for Western Horse & Gun Magazine, I spoke with R. Brad Tanner, DVM, with Rood & Riddle Equine Hospital in Lexington, Ky., about taking your horse to an equine dentist on a regular basis and how dental health can be a big component of your horse’s overall wellbeing.